The to do list is getting smaller. So the Blackheath Halls Concert on Friday went better than we expected; we didn’t make too many mistakes in Navidad Nuestra, and The Lamb sounded very good. Despite not being well, Nick Sharratt sang beautifully. The children’s choir were brilliant. 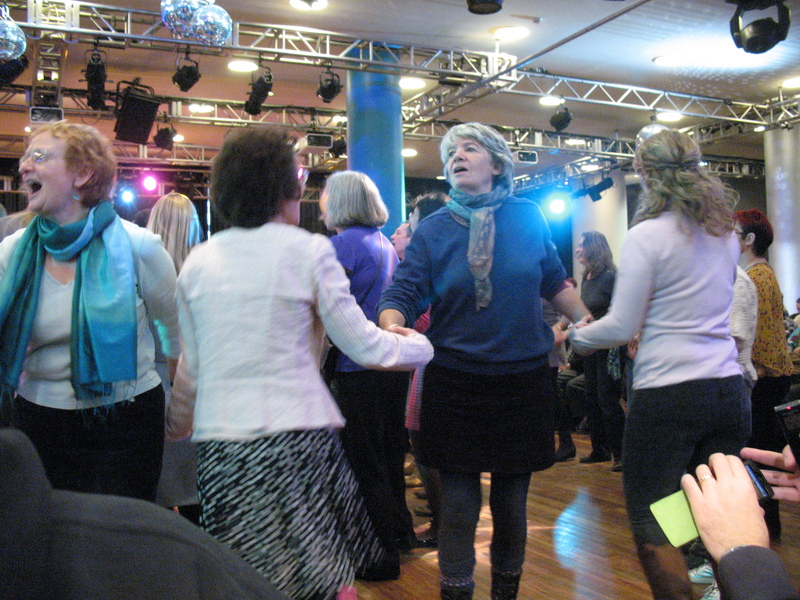 Raise the Roof were enthusiastically received and had the audience clapping along in no time… and Mel won the raffle! A woman passing me in the corridor said that Navidad gave her tingles. Just think what it could have been with another three rehearsals. 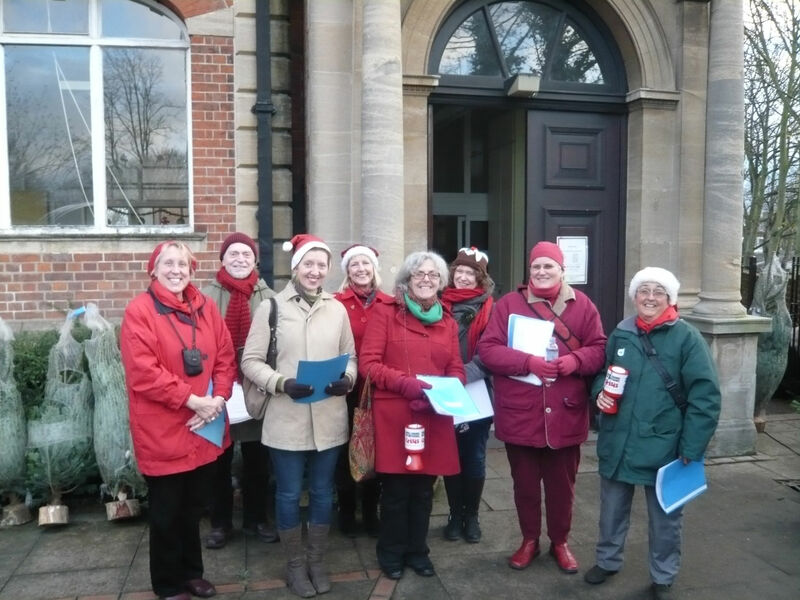 Saturday Summer all Year Long went carol singing in aid of Crisis, with me muttering as we headed off that I wasn’t in favour of us performing ever again too much hassle, just meant to be a bit of fun, etc. etc. 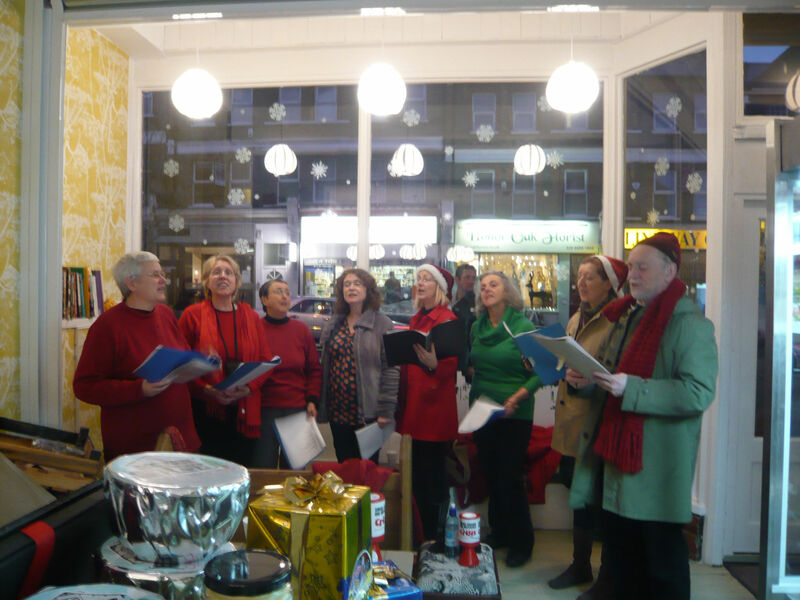 Apart from completely losing the low harmonies in Wassail, we sounded very good; I think our voices blend well and we make a nice warm noise – we even had someone tweet positively about the Crofton Park Library gig. However, a learning process: while the Library has a lovely acoustic, it’s not a great venue. The nice men selling Christmas trees outside gave us a substantial amount of their float, but most people in the library were plugged into computers and waiting for us to go away; everyone contributed something though. A more positive reception at Hills and Parkes, where we were fed mulled wine, and Emma joined in on Wassail. One customer was thrilled and stayed right to the end of the set. We stopped on the way to sing to a housebound neighbour, much to the amusement of the people up the scaffolding a couple of doors down. 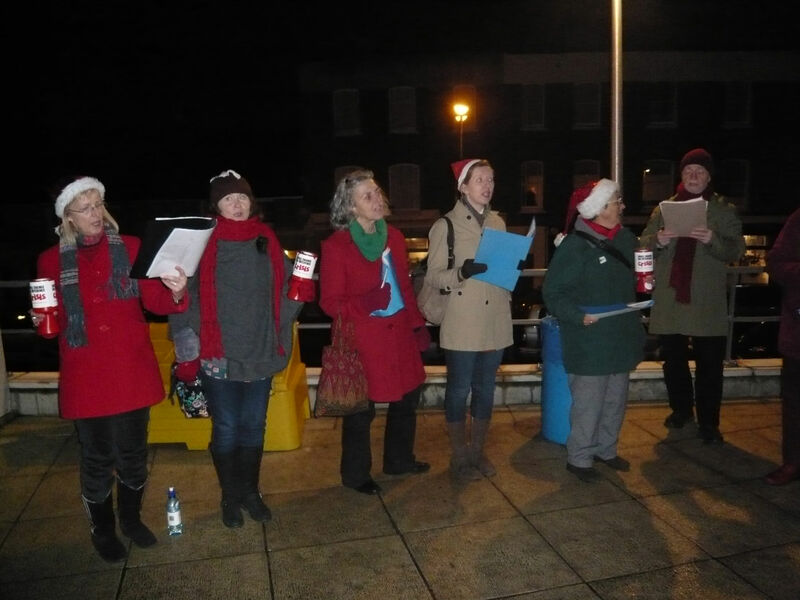 We were early at the Broca so had a cup of tea and waited to see if any audience were going to turn up, and when they didn’t, we went and sang outside the station instead (with their permission), which worked very well, people emptied their pockets and gave us handfuls of money. I think with H&P’s mulled wine sales we’ll have raised a reasonable amount, but you can make it MORE by donating on our fundraising page. (Thank you). we are now considering becoming the Overground Choir for a day next year, and travelling up and down the line singing on station forecourts. What was that about not performing again? The others talked me round in about a nanosecond, and we’re wondering about a set of shanties and other sea related songs at the National Maritime Museum at some point (if they’ll let us), perhaps in aid of RNLI. Anyway, the new year will bring new songs with possibly a spring theme, we’ll see. Sunday to Welcome Yule! Voicelab’s bash at the Southbank. A most enjoyable collection of drinking songs and warnings (you don’t want to know what happens to people who plough on Christmas day). These were carols after my own liking, steeped in ancient beliefs and passions, sung with gusto, accompanied by a bit of piano, fiddle and brass, and Morris dancing. The excellent Morris Offspring, a very young side wearing black and denim, with just a token sheaf of ribbons and no bells: I don’t know whether Morris is getting better, but each time I see it I like it more. It seems to be less and less about men getting into their beer and then thrashing about with a staff or a hankie, and more and more about some magnificently pagan ritual. This was some seriously beautiful dancing, a real highlight of the season so far; so good I forgot to take any photos…! This entry was posted in Community, London, music, review, Singing and tagged Blackheath Halls, Broca, Cherry Potts, Christmas, Crisis, Crofton Park Library, Folk Music, Hills & Parkes, London, Music, Navidad Nuestra, Raise the Roof, Southbank, voicelab by Cherry Potts. Bookmark the permalink.